Stringing beads on a cord is not difficult, but it does require a thorough understanding of the pros and cons of the various parts and stringing materials that you will use. Thus, the bead stringer has to wear many hats and bring with with her or him many different kinds of knowledges, techniques and skills. The jewelry designer has to be an artist. An architect and engineer. A social scientist. A planner. Someone familiar with the physics and mechanics of movement. Someone with an intuitive understanding of people, culture and society. As a jewelry designer, you have many different kinds of choices to make. The “best” clasp is one that has no moving parts. A toggle has no moving parts. An S-clasp has no moving parts. A hook & eye clasp has no moving parts. In jewelry design, when we talk about moving parts, we include things like all the mechanical mechanisms built into a clasp. For example, lobster claws and spring rings have a spring mechanism built in to open and close them. We also include, in our definition of moving parts, any part of a clasp, where the movement of that part in opening/closing that clasp, might result in that part breaking. A box clasp illustrates this well. A box clasp is some decorative box with a tongue that goes in and out. In a box clasp, there are two moving parts. First, is a mechanism inside the box that holds the tongue in place. Second is the tongue itself. The tongue is a metal piece bent into a V-shape. As you push this piece in and out, the V moves back and forth. When you bend metal back and forth enough times, it breaks. So we consider the tongue a moving part. Pearl clasps also have a similar tongue, which breaks relatively easily, from bending back and forth. The “best” stringing material is needle and thread. Any piece strung on needle and thread will take the shape of the body. It will move the best, drape the best, and feel the best. If I make a bracelet with needle and thread, and move my arm to the left, the bracelet, too, will move to the left. It moves with the body. If I strung the bracelet on a cable wire, the bracelet would be a “circle”, while my wrist is an “oval”. If I move my wrist to the left, the bracelet will actually move in the opposite direction to the right. When you see women’s necklaces turned around, they are typically done on cable wire. Needle and thread is very time-consuming. In bead-strung pieces, you always go through all your beads 3 times. You start at the clasp and tie a double-knot. You go through all your beads and come out the other end. You tie a double knot to the ring. Then you take the needle and thread back through all your beads and tie a double knot to the clasp. Then one more time: back through all the beads and tie a double knot to the ring. With needle/thread, you have to use a needle and you have to wax your thread. If you are selling your pieces, it is very difficult to get your labor costs out of needle/thread work. You almost always have to use something like a cable wire. As long as you have some experience with and know the techniques of the “best” clasps and stringing materials, it becomes easier to step down from the “best”, and compensative for any deficiencies with various jewelry design tricks. When choosing a clasp, this choice should either precede your design, or co-occur at the same time as your designing process. Most people, however, design the beadwork first, and then choose a clasp. Unfortunately, too often, in this case, the clasp looks like an “add-on”, and not an integral part of the piece. When we talk about choosing a clasp, in the Art and Design Tradition, we talk about choosing a “CLASP ASSEMBLY”. The Clasp Assembly is everything that has to come together in order to attach the clasp to the beadwork. The “CLASP ASSEMBLY” usually consists of several parts. Besides the Clasp itself, there are probably jump rings and connectors, crimp beads, clamps or other jewelry findings. The “Clasp Assembly” is more specific term for something in jewelry design known as a “Support system”. The support systems through a necklace or bracelet are similar to the joints in your body. They aid in movement. They prevent any one piece from being adversely affected by the forces this movement brings to the piece. They make the piece look and feel better, when worn. Support systems can be loops and rings, which allow free movement. They can be hinges and rivets. The Clasp Assembly is the most important support system in any piece of jewelry. In any one piece, there may be 2 or more support systems. If we had an S-clasp, and used a cable wire/crimp strategy, the support system would consist of two soldered rings (one on each side of the S-clasp), as well as the loops in the cable wire, as these are attached to each side. If I had pushed the crimp all the way up to the S-clasp, and did not use any soldered rings, I would have a stiff line of metal. The cable wire is metal. The crimp bead is metal. The clasp is metal. All jewelry moves. When metal is stiff, and you move it back and forth, it breaks. The crimp breaks. The cable wire breaks. The clasp breaks. Hence, the soldered rings allow movement and support. Leaving an adequately sized loop in the cable, as it attaches to the clasp, allows movement and support. Other points about clasps. The best clasp is one that has no moving parts. 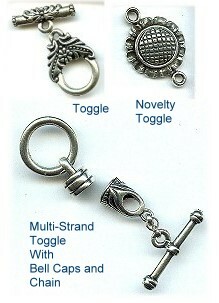 These include toggles, buttons, slides, S-clasps, and hook & eye clasps. The clasp should be proportional to the beads used in the piece. The full Clasp Assembly should be proportional to the piece as a whole. If half your bracelet is taken up by the Clasp Assembly, then there’s a problem here. Don’t forget that you can also use clasps in a way where they are meant to be worn on the front, not behind the neck. They can be used to sit on the side or on the bottom. Clasps which are very decorative are used in this way. All clasps work well in necklaces. In bracelets, however, care and consideration should be paid to how difficult or easy it is to secure and undo the clasp – especially if the wearer has to accomplish these steps by her or himself. In better pieces, the clasp seems as if it is an organic and integral part of the rest of the piece. It does not feel as it were an add-on. As a designer, one of the things you need to anticipate how the piece will be viewed and understood. You have some powerful information here. Jewelry plays several psychological functions for viewers of the jewelry. Two interrelated functions that happen when the viewer first sees the jewelry and tries to interpret it give powerful information to the designer, and are very connected to the designer’s choices about clasps and attaching clasps. When a viewer first cognitively interacts with the piece, she tries to “make a complete circle around the piece”. If something about the piece slows her down, or otherwise disrupts this natural cognitive process, she begins to feel some anxiety. This might be a clasp that doesn’t coordinate well with the beadwork. It might be an inappropriate or poor use of color, shape, texture, pattern, or size. The viewer translates this situation as seeing the piece as ugly or boring or unsatisfying or some other negative characteristic. The second thing the brain tries to do is “come to rest.” We usually achieve this by creating a focal point. We might use a pendant. We might graduate the size of the beads, or graduate the color intensity or value. People are prewired with an avoidance response. This protects the viewer from things like snakes and spiders, by making them want to avoid things which are ugly or dangerous. When someone views the jewelry for the first time, they have to interpret it — do they like it? not like it? find it appealing? not appealing? want to come closer to it? or farther from it? As a designer, you now know that the viewer’s brain/eye always will first try to make a complete circle, and then come to rest. Anything that impedes this will result in a negative evaluation of the situation. And you know, if the viewer finds the jewelry ugly, they will attribute the qualities they see in the piece to the person wearing the piece. Cheapest and worst clasp. Mechanical mechanism breaks easily. It is sleak and dainty, and few other clasps are. Popular but weak design elements. Lip can’t handle excess force from tugging or pulling. Mechanical mechanism breaks. Passes the guy test – guys can figure out how to open and close it. Relatively inexpensive. Many designs which can work with the design and flow of your piece. Easy for the viewer to make that complete circle with their brain/eye. This is the kind of clasp that is OK for moderately or inexpensively priced jewelry. This is not an acceptable clasp for expensive jewelry. A clasp that if the hook comes undone, something catches it before the necklace or bracelet falls off. Popular clasp, and a traditional element in many pieces, such as a pearl-knotted necklace, or Victorian jewelry. In fact, you would be hard-pressed to use an alternative clasp in a pearl-knotted necklace. Not a great design, however. The hook element must be bent back and forth many times as it is taken in and out of the clasp, so we consider this a moving part. This causes it to break sooner than later. If this clasp fits with your design, this is considered the best clasp. It is considered the easiest to get on and off, and the most secure. Almost every toggle has been cast, and the ring and the bar are very tightly engineered to work with each other. NEVER mix and match rings and bars. Always use these as a set. The major thing to keep in mind is that the last half inch or so of beads on the side of the piece connected to the bar, must be small enough to slip through the circle part of the toggle. You need to be able to pull through the ring-hole the width of the bar PLUS the width of the strand of beads. Multi-strand toggles have a short piece of chain or a length of interlocking jump rings on the bar side. (This chain is not needed on the ring side, but sometimes people include it, for symmetry purposes). Say you had a 3-strand necklace. You can add 3 links of chain. You attach one strand to the top link, another strand to the middle link, and the last strand to the bottom link. This graduation of strands lets you pull the width of the bar plus only the width of one strand through the ring, so that you can saddle the bar on the ring. One drawback to toggle clasps is that most are visually large, and may be out of proportion to the piece as a whole. In this case, they will get in the way of yoru brain/eye making that complete circle. There are novelty toggles that address this kind of issue. For example, we sell a toggle where the bar and ring combine to form a sunflower. This would work great on a flower themed piece. You can make your own toggle clasps using a button or a large bead, and fashioning a loop from 11/0 or 8/0 seed beads. The button can be a real button, or a bead. The great thing about button clasps is that you can incorporate the clasp as part of the design of the piece. You can match colors and beads that blend right in with the piece itself. It helps the brain/eye make that complete circle. The hardest part in making a button clasp is the button hole. If the hole is too small, it’s hard to get the button or bead in and out. If the hole is too large, the button or bead can slide out and the piece will be lost. To make the button hole (loop), attach a thread to the piece, preferably a little further back from the end of the piece. Where exactly you locate the button loop depends on your design; however, in most pieces, stepping back from the edge ends up with a better looking product. After anchoring the thread to the piece where you want it, now string several small beads until you have a line of beads when looped, will fit snugly over your button or bead. Bring the needle and thread around and anchor the loop to the piece. Tie it. Now bring your needle and thread back through the loop, one or more additional times (until it’s getting very tight inside the bead), reinforcing the bead hole. Now tie it off, and weave the loop end into the piece, hiding the end of the thread. Now, take your bead or button, and attach it to the other end of your bracelet. Ideally, on a beadwoven piece, you want to step the bead or button a bit back from the edge. When choosing a bead, it must be large enough for the loop to be secured underneath it. If you located the bead and loop at the edge, you run into two problems. First this is the weakest anchoring point. When you wear a beadwoven bracelet, the ends move back and forth and back and forth, as you are wearing it. The effect here is to keep tugging on the threads on the outer boundaries of the piece, wearing through them. The other problem is that when you put the loop over the button, there’s still a gap there where skin will show, and impede the brain/eye from making that complete circle. You want to attach the button back a bit from the edge, and anchor the loop back a bit from the edge. Now when the loop goes over the button, no skin shows, and the brain/eye can easily make that complete circle. Let’s look at the side of the bead woven piece where you place the button. You do not want attach a bead or button flush to the surface of the piece. Allow enough space for the loop to clasp underneath it. This is easily achieved by placing a size 11/0 or 8/0 seed bead between your piece and the bead or button. Without a seed bead between you button and the beadwork, you have your loop rubbing against the thread that is attaching the button. Remember, as you wear the piece, the ends are moving back and forth, so the loop is basically sawing the threads. With the bead there, the loop moves around the glass button. With the bead there also, it reduces the amount of back and forth movement, as if it were seating the loop into a saddle. If the bead is elongated, you must anchor it at the center, not through either end. Otherwise, there would be no place for the loop to clasp beneath the bead. There is not a sure-fire way to measure a loop to fit perfectly over a button or bead. So don’t beat yourself up if you don’t get it right the first time or two. As a general rule of thumb, the loop should be a bit more than twice the diameter of the button or bead. Keep practicing and you will get to a point where it will work by instinct. If used correctly, this is a great clasp for necklaces. Most are awkward in a bracelet. There is always some design so that the brain/eye can make that complete circle. The simple S-Clasp Assembly consists of an S-shaped piece and 2 soldered rings (one on each side). On one side of the “S”, you should position the hook so the O-ring cannot slide out. On the other side of the “S”, you need to position the hook so that the O-ring can slide out, but only with some resistance by the hook. So you make your beadwork, attach it to the soldered rings on either side, and then position the arms. When you move the arms, you move them side to side. Never up and down. Moving them up and down will make the arms break off. Most people do not know how to position the arms. When they put it on or take it off, they fidget with the arms, and don’t set them right, or re-set them right. If not set right, the S-Clasp loses its functional advantages. This is a clasp that I rarely use, because it is not very user friendly. This is a very good clasp for bracelets and necklaces. You can always find one that helps the brain/eye make that complete circle. This consists of two parts – a hook and a ring or figure 8. If you can, position the hook so that the O-ring can slide out, but only with some resistance by the hook. This is the clasp I use the most. While functionally it’s a “B+”, it has high marks for usability. These also don’t compete with my beadwork. People in general hate clasps, so they love these. These work well in necklaces, but not as well in bracelets. To open and close a magnetic clasp, you never pull on them. This weakens the settings for the magnets, and the magnets eventually pop out. Instead, slide the two sides apart, or crack them open like a nut or hinge. Never pull. On bracelets, we suggest adding a safety chain. Otherwise they are easy to leave on the refridgerator or car door. You can see on a bracelet how the wearer might be tempted to pull them open. The bracelet wearer may also pull on the beadwork itself to open the clasp, thus weakening the bracelet. In this case, I would always do some extra reinforcing of the ends of my piece, if using a magnetic clasp. These are usually used in bead woven pieces, but they can be used on strung pieces. They are generally easy to get open and closed. They become part of the piece and its design itself, thus not competing with the artistry of the bead weaving. These clasps do wear out, as they are repeatedly opened and closed. 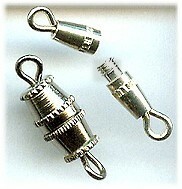 There are many manufacturers and brands of these clasps. The best ones are made of brass, and have the “male” part be as square-ish as possible. If the base is too narrow, the ring rides the knob at an angle, and easily slips off. Snap clasps are the number 1 clasp used in China. They are on every bead strung and bead woven piece. The original snap clasps to be imported in this country had “Patent Pending” stamped on the ring. These are good clasps, but I don’t find them the best ones available. These are very popular with college age and early 20’s. They are not the best clasps in the world, but are very popular. These clasps have a weak design element on each end where the clasp is to be connected to the ends of the piece. Most barrel clasps use a type of eye pin/head pin, and these break as they get bent back and forth from movement. Never use a sterling silver barrel or screw clasps. As the silver softens at body temperature, the threads soften and strip. Let’s say you have a customer that wants an all sterling necklace with a barrel clasp. If you came to Be Dazzled, we would suggest dropping down to the costume level. These barrel clasps are plated over steel. They get a little darker with age. Screw clasps tend to look like a bead with a loop on either side. Usually, one side, sometimes both sides, screw open. These are very attractive and work very well to maintain the organic flow of your piece — your brain/eye can make that complete circle. However, the threads strip easily, and its difficult to readily figure out how to screw/unscrew the loop out from the bead. I would avoid screw clasps. These clasps are found on a lot of jewelry. They are pretty easy to attach. They are pretty easy for the wearer to use them. On one side of the clasp, there is a closed loop. This is attached to one end of the piece, usually with a jump ring. It is fixed. The other end is a tongue that snaps over a base and is held in place by friction. This tongue slips over a ring on the other side of the piece, and then tightly onto its base. After opening and closing this clasp several times, the tongue tends to bend upward, thus losing its friction-based tight close. You can use a pliers to push the tongue back and regain the friction. Eventually this tongue breaks off. While you see these clasps on a lot of watches, I would normally be uncomfortable using these clasps on an expensive piece of jewelry. Most wear-out their friction in short periods of time. Here a curved wire or tube on one side slips into a curved tube on the other, and is held in place by friction. These look great on sleek pieces. For most of these, it’s easy to slip beads or charms over the clasp without having to partially or fully dis-assemble it. These are usually soldered or clamped on to the piece. You need to pay attention to the size of the internal diameter of the opening. You want your cable wire or cord to fit snugly into this opening. Put some glue on the cable wire or cord. Stick it in. Use a pliers to clamp the ends down snug. Don’t clamp them flat. The openings on these come very small for cable wires. And they can come as large as 3-4mm for braided leather. You want to match the thickness of your stringing material to the opening in the tube. You put some glue on the stringing material — any glue except super glue. Preference for a glue that dries like rubber like E6000. All jewelry moves. Superglue dries like glass, so the bond shatters like glass. And the shattered bond looks like a piece of glass. E6000 acts like a shock absorber. You stick the cord into the tube as far as you can. You take a chain nose pliers, and crush the end snug, not flat. You crush it snug to be sure the glue adheres to all the surfaces inside the tube. If you crushed the tube flat, then the two flattened ends would disturb the viewer, and get in the way of the brain/eye making that complete circle. The basic design here is a box where a bent piece of metal (called a tongue) slips into one side of the box, and is held in place by an internal latch. These often look great, but they don’t last a long time. The internal latch often wears out, especially if the clasp is sterling silver. The tongue is bent up and down each time it is place in or removed from the clasp. After too many times, the metal breaks. It’s hard to find replacements. What’s nice about these are that they come in a wide range of prices and styles, and can adapt easily to the organic sensibility of your piece. These are fine for moderate or inexpensive jewelry. With expensive pieces, you have to make a judgment call here. These kinds of clasps might enhance the appeal of your piece, and you might want to tradeoff some of the durability for visual appeal. This is a wire that is bent into a clasp shape. One end of the wire overlaps that of the other side, and is “springy”. These clasps will lose their “springy-ness” over time. I like to use these clasps with hemp necklaces. They work well with thick cords. They have a primal feel about them. They are often used with badge-clip jewelry. The small arch on one end is pinched in a bit. This makes the arch act like a spring. It absorbs all the force of the arm bending back and forth. It if had been a simple arch, then the bending back and forth of the arm would make it break over time. These are made for multi-strand necklaces, from 2-strand to 9-strand. They are basically two inter-fitting tubes with loops soldered onto them. They keep closed through friction. They are very sleek. They come plain and patterned. They work for bracelets and necklaces. For some reason, and I don’t understand the mechanics, these clasps are great at keeping the multiple strands very organized, and not tangled or out of place. This is a clasp I like a lot. It helps the brain/eye make that complete circle. It is user friendly. It functions very well. Here we have a loop with a slight opening, with a bar and knob that moves from the base of the loop, over and into the slight opening. These are attractive. They are relatively easy to use. They do loose their friction in holding the knob into the opening. With these, two removable loops hold the beadwork in place, so you could make many strands of bead work, and use them interchangeably with this clasp. Wear one strand one day, and 4 strands the next. Many designers fail to make use of the full range of these pieces available to them. They either don’t know about them, or are afraid of them or that they might use them incorrectly, or they limit their own design possibilities by relying on the same limited set of findings for everything they make. But the world of possibilities that these jewelry findings open up for us is endless. Below is a list of other major jewelry findings used in bead stringing. I’ve tried to group them into three categories to make it a little easier to relate to. These kinds of jewelry findings are mostly used with thicker cords, like leather and waxed cotton, and cable wires. These enable you to create a “loop end” on either side of the cord or cable. From these loop ends, you then continue to create the rest of your clasp assembly. If the loop is big enough (to give you jointedness), or looks substantial enough (like it won’t break from movement), you can attach the clasp directly to the loop. 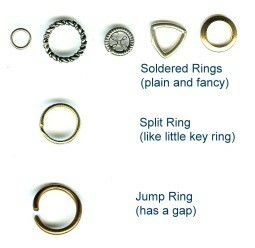 If not, you will want to attach your clasp/ring to jump or split rings, and these in turn to your loop ends. You usually try to match the size of the interior opening on the jewelry finding to the thickness of your cord or cable. For some of these pieces, this match is more important than others. You always put some glue on your cord or cable before you stick them into the piece. You use glue because all these cords are oily, and some will sweat, as well. They will slip out of the findings – even with tight crimping or clamping – because they are slippery. That’s why you use glue. I recommend using a glue like E6000 or Beacon 527. Don’t use super glue. Super glue dries like glass, so the bond will shatter like glass, because all jewelry moves. Also, after it shatters, the bond looks like a broken coke bottle. E6000 and Bond527 dry like rubber, so they act as a shock absorber, when the jewelry moves. These pieces have a loop at the end of a tube. The tube has 3 bands. The bands can be decorative or plain. The first and third are decorative. The center band is meant to be crimped. You put some glue on the cord or cable, stick it into the tube, and take a pliers and crush the center band as flat as you can get it. So both the glue and the crimp are holding. The flattened center surrounded by two bands seems like it is part of a pattern. These pieces have a loop at the end of a split tube. For chain, these are soldered on. For cords or cable, you put some glue on, stick it into the split tube, and take a pliers and crush snug, NOT flat. What’s holding these on is the glue. If you crush flat, you lose the bond. Should tightly match cord thickness to interior diameter. These pieces have a loop at the end of a hard metal tube. You put some glue on cord or cable and stick in. The glue is all that holds. Should tightly match cord thickness to interior diameter. Ribbon Clamps: These clamps are folded metal with a loop in the center edge, come in different lengths, and have teeth. These are for ribbons or fabric. You don’t use glue, because the glue will bleed into the ribbon or fabric. You fold over the end of the ribbon or fabric to make it pretty and “finished”, stick into the clamp, and use a pliers to crush firm. If your material is wider than the clamp you have, you would make several folds in the end, like you would when gift-wrapping a package. Foldover or Wing Clamps: These typically are a loop on top of flat metal with two wings that fold over. You put some glue on the cord or cable, sit in the saddle between the two wings, and use a large pliers, and crush the two wings over each other and over the cord. Crush as flat as you can get it. One mistake people make with this piece is that they crush snug, not flat. Where the wings overlap each other, this leaves an air passage. If you crush snug, this air passage will weaken the bond, and your cord will pull out. You have to crush as flat as you can get it, so glue gets up into air passage. You can also use one clamp on each end of a multiple strand piece, by clamping all the strand-ends together on each side of your piece. Coil ends have an open ended loop at the top of a tightly wound coil. I don’t like the way these look after they are crushed onto the cord, and they don’t hold up well. One advantage is that the coil functions as a spring, and absorbs a lot of the excess force place on the piece, that comes from movement. With coil ends, you put some glue on the cord, shove it into the coil. You take a pliers and crush the first two rings of the coil onto the cord. If you crush too hard, you’ll slice the cord. If you don’t crush hard enough, the cord will pull out. This takes some practice to get right. The way the loop was designed to work, was that you take a pliers, move the open ring to the side, slip on your clasp or ring, and, using the pliers, move the open ring to a closed position again. DON’T DO IT THIS WAY. When you move the loop back and forth, it breaks off easily. SO, the way you would use this, is that you would take a jump ring or split ring, and attach this to the loop on your coil-ends. Then you attach your clasp piece to these rings. As long as you don’t move this loop wire, it stays strong. Coil ends come in two sizes in terms of the width of the interior diameter. If your cord is thicker than the smaller size, see if you can make it work with this, anyway. The larger size is more awkward to use. Say you had leather cord. You can cut the end at an angle, put some glue on the cord, and shove it into the smaller piece. This is a decorative cup-like or bowl-like piece, with a hole in the center. This piece is originally used as a decorative element, to cover one or both sides of a bead, as you string your beads on. However, you can adapt this piece to be an end. You might have multi-strands, where you tie them all off together, and use the bead cap to hide the mess. You might have a bead crocheted rope, and again, use the bead cap to give your piece a decorative end. You glue the bead cap on. Then you take an independent wire or thread and run it through your piece, through the cap, then finish off your clasp assembly. What’s nice here are that there are hundreds of styles, whereas the more typical jewelry findings look very utilitarian. This is a decorative cup-like or bowl-like piece, with a loop sticking above the center. This piece is originally used to adapt something, like a crystal pendant or bead, to be a drop. But it can be adapted to use as a fancy end-cap. Use glue here. Attach the clasp assembly to an additional jump ring or split ring. Again, there are many, many decorative styles in bell caps, so you won’t have to rely on the typical and very plain specialized jewelry findings. These pieces are used to hide knots. One style has a cup with a tongue attached. The most widely used style – Clam Shell Bead Tip (or double-cup) – has two half cups that close over the knot, and a tongue extending from one end. While some people use these pieces with cable wire, they are primarily designed for use with needle and thread. These take some practice in learning how to use them. On the first side of your piece, you string on the bead tip, say the clam shell. You tie a bunch of knots in the tail, so your knot is bigger than the hole in the bead tip, and won’t slip out. Cut off the tail. Put a drop of glue on the knot. Here you would use something like superglue. Superglue will make the knot stiff, so it won’t pull through the hole. E6000 will make the knot rubbery, and it will be able to work its way through the hole. Press the two halves of the clamp together over the knot, so it looks like a bead. Take the tongue, fold it over and through the ring on your clasp, and back to itself, so it forms a loop. On the other side of your piece, here’s the tricky part. You need to keep your tension on the thread, so the thread doesn’t show when you’re finished. You need to tie a bunch of knots, and complete the rest of the process. This is a 3-hand operation, but you only have 2 hands. Here you slide the bead tip onto your thread. Use one hand to hold everything tight. Take an awl or a round nose pliers (something that graduates down in size from top to bottom), and put the tip where you want your finished knot to end up. Tie an overhand knot over the awl or pliers up high on the jaws. Tighten the loop of this knot. Tighten the tension on your thread. Move the loop down the awl or pliers a bit. Tighten this loop. Check your overall thread tension. Move the loop down a little bit more. Tighten this loop. Check your overall thread tension. When you loop gets to the tip of your awl or pliers, you need to pull your knot tightly, and push the awl or pliers out of the way, AND, you want to maintain the thread tension in your piece. Tie a bunch more knots. Put glue on the knot. Close the clamp. Loop the tongue into the other part of your clasp. When I started making jewelry in the 1980s, bead tips were used on everything. But they have a significant flaw, in that they are not sufficiently jointed. The tongue part that slips into the ring on a clasp, does not allow for a sufficiently-sized loop. Therefore you have an unjointed piece of metal bending back and forth as the piece moves, and it breaks off. I prefer to hide “ugly knots” by slipping a crimp cover over them. Cones come in many shapes and designs, but basically look like a megaphone. These are used to finish off the ends of jewelry, often to hide a lot of messy knots or unfinished ends inside the cone. One style of cone is called a 3-to-1 cone (also, 2-to-1 up to 11-to-1). This is a flattened cone, with one hole on one side, and 3 holes on the other. This is supposed to help you finish off a 3-strand piece in a decorative way. You pull each of 3 strands through the 3 holes on one side, and out together through the one hole on the other side. For two of the strands, you tie a large knot or double-knot, cut off the excess tail, and let the knot fall back into the cone. I’ve only known one person in my life who could accomplish this, and maintain the stringing tension without having some of the cable wire showing on the bracelet. For the 3rd string, you would continue creating your clasp assembly. This is a good piece in theory, but not practice. Most people end up tying the three strands into this big, globular knot, and then trying to finish off the clasp assembly, only to have the clasp assembly take up 25-30% of their finished bracelet. This definitely works against the brain/eye trying to make that complete circle. With the typical cone style, the way you are supposed to use this piece is as follows: You take a soldered ring, something small enough so that it will fit far enough back into the cone, that the cone will hide any of the finishing knots or ends. If we start with a 3-strand necklace, you would tie off each strand to the soldered ring. Then you would take a separate, independent cable wire, hard wire or thread, tie it off in a knot to the other side of the soldered ring, pull the whole works into the cone, with the stringing material coming out the narrow end. Then you would finish off your clasp assembly. The soldered ring, in this case, acts as a “support system”, creating jointedness, and you hide this support system within the cone itself. Otherwise, without it, all the pieces are metal – cable wire, cone, clasp, crimp — , and if these are too stiff and can’t move easily, then when you bend metal back and forth, it breaks. A major category of jewelry are eyeglass leashes. You make an eyeglass leash by attaching an eyeglass holder end to the eyeglasses, making a string of beads, attaching the string of beads to a split ring, and attaching the split ring to the eyeglass holder end. You never attach the beadwork directly to the holder ends. Eyeglass leashes take a huge beating, as they are worn, and you need to create as much jointedness as possible, so you don’t ruin someone’s eyeglasses, or have the leash break. Eyeglass leash holder ends are made from round rubber thong (usually black or clear), flat vinyl (usually black or clear), or elastic cord (comes in many colors). The round rubber thong is the most durable. Elastic cord is not durable at all. There are various style options. Most come with what is called a “coil center”. When the eyeglass leashes are worn, the rubber, vinyl or elastic cord sweats, both from the humidity found in the air, as well as the wearer’s own body sweat. Coil centers tend to slip, so these don’t work well with narrow arms on eyeglasses. Other eyeglass leashes come with a bead center, usually a 6mm glass roller bead. The beads don’t slip. These pieces are used to adapt watch faces so you can make beaded watch bands off them. They consist of a tube designed to slip over the spring bar of a watch face, and some kind of loop or series of holes that come off the tube. Beaded watch bands have become so popular, that now you can purchase watch faces designed specifically to attach these to them. Crimp beads come in many styles, sizes and finishes. These are used to secure cable wires to clasps. The crimping process involves crushing the crimp onto the cable wire, and then re-shaping it so it looks like a bead again. You Never push the crimp all the way to the clasp – this creates stiffness with metal parts, and general movement would cause these to break. The crimp is metal, the cable wire is metal, and the clasp is metal. Never push crimp all the way to the clasp. You always leave a large enough loop to create a support system (jointedness). In this case, we have to fight our prewired tendency to want to make a complete circle, and let the loop get a little bit in the way of that. Crimp Covers are U-shaped beads that slip over the crushed crimp. You push the two sides of the U together, so you have a pretty bead. Horseshoe wire protectors serve several purposes. They force you to leave the correct size loop in the cable wire, so that you have the appropriate support system or jointedness. These also make the loop more finished looking – better than a bare-wire loop. These prevent the cable wire from folding into a V over a period of time and wear. If the wire were to change from an arched loop to a V-loop, the wire then would more easily bend back and forth and break. Silver-plated crimps are plated over brass. Brass has a very high degree of integrity as a jewelry making metal. Once brass is crushed, it stays crushed. The plating wears off relatively quickly, and your crimps will look black. Sterling softens at body temperature. If your crimp is resting on the wrist or the neck, there is some risk of it softening and weakening. This risk is minimal, however. If you’ve crimped correctly, you shouldn’t lose sleep over this. You can also use a silver-plated crimp to crimp, and slide a sterling silver crimp cover over it. Some people don’ t like the look of the re-rounded crimp, or feel uncomfortable trying to re-round them. The crimp covers add about $0.50 more to each piece. The twisted tubes (sometimes called Tornado or Cyclone crimps) are a little more expensive than the plain ones. When you crush the twisted tubes, they look decorative enough that you don’t have to re-round them. You definitely need to re-round the plain ones. Short tubes or half tubes are primarily used in pieces like illusion necklaces, where you have a cluster of beads, and the cord shows, another cluster of beads, etc. Half tubes are used on either side of the clusters to keep the beads in place. When you crush the half tube, the volume of space it takes up is not noticeable. When you crush the regular sized tube, it’s volume of space is too noticeable and detracts from the general look of the piece. One mistake people make with the short or half tubes, is that, when they use them to finish off the ends of jewelry, their mind tells them to use 2 or 3 of them so that they will “hold better.” A crimp is a crimp, and if you crimped correctly, there is no difference in holdability between the short and longer tubes. Each crushed crimp you add becomes like a little razor blade. All jewelry moves, so you’re increasing the chances one of these crimps will cut through the cable wire. One crimp on either end is enough. Basically, you get what you pay for! Here’s how crimp beads are made: You start with a sheet of metal. You roll the metal into a tube. You buff along the seam where the two sides meet, so that it looks like it’s been soldered together. However, there’s really a seam there. So often, people come into our shop and tell sad tales of failed crimps and broken bracelets and necklaces. They blame themselves. They blame the pliers. But they never blame the crimp beads. In most cases, the crimp is at fault. Cheap crimps, usually bought in small packages, usually at craft stores, are not made well. When you crush these, they tend to split along the seam. Sometimes you can see the split. Othertimes, you can’t quite see that the two sides of the tube have started to separate. Your cable wires pull out. Or your crimp edges have cut into the cable wire. An A-grade crimp, usually costing about 3 times what the cheap crimps cost, can hold up to your initial crushing, as well as another 8 or so clamping down on it during the re-rounding process. There are heavy-duty or A+ grade crimps. These run about 4-6 times what the cheap crimps do. You don’t have to worry about any splitting, no matter how much you work the crimp bead with your pliers. Using 1 crimp on each end of your piece is sufficient. Using more than 1 crimp on each end is too risky. When you crush your crimp onto the wire, it becomes like a little razor blade. All jewelry moves, so your crimp is constantly trying to saw through the cable. Using more than one crimp on each end increases the chances that one will saw through. These are multi-hole pieces that are used to keep multi-strand pieces neat and organized. In a bracelet you might use 3-5. In a necklace, you might use 5-7. Some of these pieces are very narrow and meant to be “hidden”. Others have a decorative edge that will be seen as part of the overall design. Separators with a broad surface are referred to as Separator Boxes. These pieces are basically a bar, with one centered loop off one side, and multiple loops off the other. For a 3-loop end bar (which has 4 loops – 1 centered on one side, and 3 on the other) would let you finish off a 3-strand piece, and then use the single loop on the other side to begin your clasp assembly. The bar can be plain, or very decorative. The bar can be straight, curved, or zig-zagged. There is a sub-family of jewelry findings originally called “Connectors”, and more recently referred to as “Linkables”. These are pieces that either have a lot of holes in them, or have multiple loops that come off them. They enable the designer to create segments or sections of beads, which are then connected to each other. They enable the designer to re-direct the flow or pathway of the piece, or to start new pathways/directions off the original piece. These are used in necklaces and bracelets, as well as earrings. The most basic connectors or linkables are rings of various sorts. Jump rings have a gap or split in them. Split rings are like little key rings, in which the wire of the ring goes around twice. Soldered rings or stamped solid rings have no gaps whatsoever. In making a choice among these, you would first try to use a soldered or stamped solid ring. If this won’t work, your second choice is a split ring. If this won’t work, either functionally or sometimes from a visual-appeal standpoint, you would use a jump ring. Bead Attach Rings are two rings soldered together, one small and one larger. These are primarily used in beaded charm bracelets. If you strung your charms on with your beads, they would get locked between the beads, and not flow freely. Instead, you string on your beads, and string on (through the smaller hole) a bead attach ring, everywhere you want to place a charm. Then you attach the charms, usually using a jump ring or split ring, to the larger hole. Rosary and Y-Necklace Components, and other multi-hole or multi-loop pieces let you segment your pieces, or take the strings in different directions. There are some beads that are considered a part of the Connector or Linkable family. Double beads are either tubes that are soldered together so that the directions of the tubes are different, or you have a tube with one or more rings soldered along its length. Say you have two tubes soldered together, and one is curved to the left and the other to the right. You take two strings, one through one, and the other through the other tube, add some beads to both, add another 2-tube-double-bead, to twist the strings in the opposite direction, add more beads to each string, another double bead, and so forth. Twister beads are round beads that are soldered together, so that the holes go in different directions. Usually these come as two soldered beads or three soldered beads. You place these in 2-strand or 3-strand necklace or bracelet, at each point you want the strands to cross over each other. Tubes with loops. These are basically a tube with a loop soldered off the middle. You string these on everyone where you to add a drop or pendant to your piece. These are basically pieces that enable you to put a loop somewhere along your strung piece of jewelry. You string these pieces on everywhere you want to add a drop or a pendant. Regular bails look similar to tubes or beads with a soldered loop off the end. Some loops are set horizontally, and some vertically, and this positioning of the loop may affect how useful it is for your piece. Pinch bail – basically a fancy V-shaped piece. The legs have pointed pinchers at their ends. You push these pinchers into a horizontally drilled drop. Austrian crystal drops, for example, are horizontally drilled. And you end up with a loop to string through. Snap on bail – basically a fancy lanyard clasp. This is used to make your pendant removable. You can snap on the bail over the stringing wire, and then take it off the stringing wire. Wire bails – basically a triangular shaped jump ring, where the gap is off to the side, rather than at the bottom. The drop or pendant won’t have a gap to pull through, because the gap is on the side. Leaf bail (foldover bail) – basically two decorative elements connected by a bar, which folds over the pendant piece, and is glued on. Use a glue like E6000. Beaver Tail – a piece with a loop that is glued onto the back of a pendant piece. Comes in different shapes and sizes. This gives you a small loop from which you attach a jump or split ring, and string through that ring. Use a glue like E6000. These pieces are a screw-threaded post, with a loop soldered to the top. You put some glue on the post, push it into a bead, attach a jump ring to the loop and string the bead on to your piece as a drop. Use a glue like E6000. This is a short length of chain, usually with a spring ring clasp on one side, and a bead-drop on the other. You can buy these pre-made, or make your own. These are used to lengthen necklaces. The spring ring clasps onto the existing ring of the necklace; the hook-clasp can clasp into any link on the chain. The bead drop is primarily decorative. These 2 ½” to 3” lengths of chain, have two tiny jump rings, one on each end. These are used to attach to bracelets, to prevent you from losing your bracelet, should the clasp come undone. You hook the jump rings onto the stringing material, on either side of the clasp. You can buy these pre-made, or make your own. Head pins are pieces of wire with a flattened or decorative end or head. You put beads on the head pin, and the head stops them from falling off. You make a loop on the other end, and string these on a necklace, or dangle them from an ear-wire or other loop. You need ½” of wire to make a loop. These come in different thicknesses (gauges). Too many people try to use the longest head-pins they can get. They end up with bent dangles and drops on funny looking necklaces, bracelets and earrings. In these cases, they could use eye pins to create more support (jointedness) within their dangles. 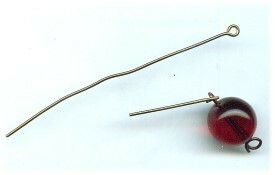 Eye pins are pieces of wire with a loop on one end. These are used to make bead-chains, such as in a rosary. You put one or more beads on the eye pin, then make a loop on the other end. To make a chain, you would keep attaching the ends of the eye pins, the previous one to the next. You need ½” of wire to make a loop. These come in different thicknesses (gauges). I’d like to see samples and descriptions of twister clasps in non-precious metals and also where they can be purchased. I want to make bracelets and necklaces at fairly low cost, so do not want silver or gold twister clasps. Have not been able to find any! Can anyone help? This trilogy of orientation documents are simply wonderful….thank you. What brands of crimp tubes are the best to use? There are no specific brands per se. With crimp beads, you get what you pay for. The price equates pretty close with the quality. Thank you for taking the time to furnish this indepth information. I enjoyed it. Thank you Warren, I was thrilled with the orientation class at the store last July. This comprehensive material covering my experience has helped me to not only re-live that experience, but to round out that knowledge and become a person who can make more informed and intelligent choices as a discerning Artisan. ( I do not feel like such a beginner now)…..Respect and Gratitude. great post, usesful information. Thanks for your sharing, eager to your next amazing post. how do you use a screw in brass barrel clasp with no loops?? if the barrel clasp has no loops, then you would not use a screw here. You would tie a knot in your stringing material, slip one side of the barrel clasp on. You put all your beads on and the last part of your barrel clasp, tying another knot which will sit inside the clasp.